Gordon Alvord started Rainier Designs in 2003 to meet demand for high quality embellished clothing in the Puget Sound area. His goal was to provide customers with superior customer service, attention to detail and affordability to businesses and organizations of every size. Gordon has a bachelor's degree from the University of North Dakota and is also a commercial airline pilot. Amy Alvord brings technical expertise to Rainier Designs with vast knowledge and experience. 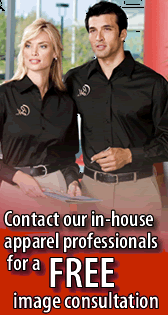 She specializes in finding the appropriate garments for a customer's particular needs and blending garments with artwork for complete uniform packages. Her experience stems from over 10 years of designing clothing for major department stores and a bachelor's degree in Textile and Apparel Management from the University of Missouri. Kathy Alvord handles all production and fulfillment for Rainier Designs. She draws upon 40 years of sewing and garment alterations to ensure consistency and accuracy for all orders. Kathy has also been involved with local business and charity organizations as a Tacoma business owner for over 30 years. She is a graduate of Pacific Lutheran University with a degree in Psychology.